Previous PostWhat Is the Significance Of A Spot On The Lung? The Three-eyed Radiologist On Incidental Pulmonary NodulesNext PostWhy Did I Go Into Atrial Fibrillation? 1- I was a self-pay at Johns Hopkins a few years back. My cardiologist cut his fee as low as he could. After I paid a couple thousand I suddenly got a second bill for more thousands. This apparently was the Hospital’s fee. So, watch out for that, although I don’t know how it can be avoided. 2- I brought a video file of an echo I had done in Costa Rica. The eminent cardiologist (Dr. Tom Traill) said his hospital does it better “but not thousands of dollars better” so he said I should bring a video file for all future visits. So, I’m not sure México or India should be dismissed out of hand. Good to hear from you and thanks for your comments! Having said that, the self pay price my hospital offers is 650$ and I am actively trying to ascertain how they came up with that # and how I can get it down. The physician component should be at most 80$. I would be interested in looking at a video file of an echo from Costa Rica to review quality and technique. My comment about not wanting to get an echo in India or Mexico was slightly light-hearted. It may be possible to get a good quality echo in those countries but I have no knowledge of their system so I would unsure of quality. On the other hand, I felt really good about Dr. Kenny’s operation based on the information on her website. In fact,since publishing that post I’ve been in touch with Dr. Kenny and will be publishing some of her comments shortly. Wow! Who knew there was so much to do with echos? Obviously you. This post lead me to read many of your other posts about echos. Thanks for the information. Thanks Elizabet! I know way too much about echo and not enough about chocolate and mindfullness. As a self pay patient that lives across the river from you, I went to Mexico to get a TTE after having an bad experience ad a different hospital (on the Missouri side). I was quoted $2500 for the services I received (TEE and Cardioversion), but was ultimately billed $6000. I’m still paying it off. In Mexico, I prepaid $225 for my TTE and $24 for the Cardiologist to read it. That said, I’d prefer to consult with you instead but I don’t trust that the quoted price will come close to what I actually have to pay. For us self pay patients, when hospitals play these games, it really has a detrimental impact. I realize that the doctors don’t really have any control of this. That said, I understand the points that you make. But, unless I can get some kind of true guaranteed price, I’ll probably return to Mexico for my next round of testing in December. My patient financial services lady tells me that we charge 650$ for a self pay TEE and 492$ for self pay cardioversion. I have not know them to charge more after stating this up front. I’d love to see a Mexican TEE! Yes. I didn’t get a TEE in Mexico, but I did see lots of excellent Guacamole and Avocado. If you are accepting new patients, I’ll probably try to setup an appointment with you in December. If not; do you have someone you could recommend that won’t preach to me about the fat in my diet? Were you able to eat any of that excellent guacamole or avocado that you saw? I do accept new patients. Individuals who have discovered and appreciate the skeptical cardiologist have priority. Unfortunately, most cardiologists I know swallowed the low fat red koolaid 20 or more years ago and can’t seem to break out of the illusory dietary quagmire. There is a HUGE difference between an echo and a TEE. You had a very expensive test and procedure! Very interesting! Thank you so much Dr P! Wow, interesting! Unfortunately I just had to pay $1,224 from a total bill of $2,719. Then another $107 or so for the co-pay. Unfortunate that I have really good insurance (or so I thought!) but in the end it’s better to have it done than regret it years down the line. 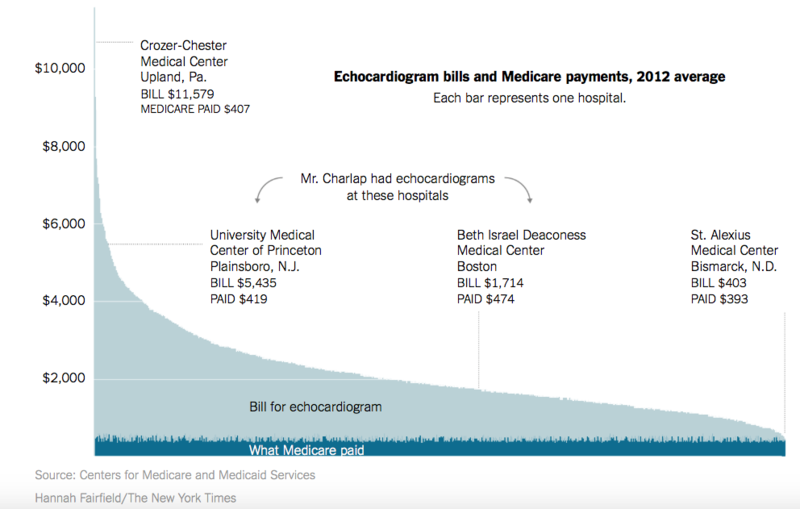 I had an Echocardiogram performed at Doylestown Hospital and was billed $850. My 7 year old son had one done a few months later at Children’s Hospital of Philadelphia (CHOP) and we received a bill for $4,700 – 5 1/2 times more. Both tests were billed as the same procedure (code 93306) and took about the same amount of time (20 minutes). These amounts are “member rates” through Aetna. Both places billed about 2X more. Amazing and infuriating to see such a price discrepancy for the same procedure. During my sons’ evaluation, the cardiologist recommended to get the test. “Mr. Concerned Parent we have a tech on site and you can get it done right now here in our facility – will take less than 1/2 hour.” “Thanks doc.” What parent would sit there and question how much this will cost. Especially since I had the same procedure done and knew what the ballpark price would be. CHOP is a great hospital but this is price gouging. Ironically, the cardiologist only billed $200 for the vist / evaluation, which I though was too low considering he spent a good 20-30 minutes with us. The cardiologist who reviewed images from the test billed $1,800 for his services. I looked up their bios and both have the same level of experience. Steve P. Interesting….my daughter just had an echo cardiogram done at Doylestown Hospital and I just got billed for nearly $1,700! I had no idea these tests cost so much! We have Independence Personal Choice. Kentucky One Health Cardiology in London, Ky which is part of St. Joesph’s East charged me $3800 for an echo. My copay was over $800 and they wanted some part of it on the spot. I could have bought my on machine for less. I will never do that again. I have little respect for most of this avaricious medical establishment. Jewish Hospital in Louisville KY (part of KY one Health) told me that because of my weight my 2d echo and stress test would have to be done over two days due to the radio isotope they had to put in me. The hospital told me the “estimated” cost was $2295.30 for thew first day and $1900.00 for the second. This is at least 3x what I had expected it to cost. That does’t make sense. We don’t utilize radioisotopes in echocardiography. Here in Indonesia, they only charged me around $100 for an echo back in 207. It was in a pretty expensive hospital for an Indonesian standard. I’ve always been fascinated by veterinary cardiology. Did they sedate/anesthetize your dog for the procedure? Do golden retrievers have particular cardiac problems? 400$ is what I think a human echo should cost actually. Here in Greece, I did one such check-up last year at a private cardiologist. I didn’t even bother with getting my insurance involved. I also did a blood test at the public hospital per cardiologist’s request. Went to the hospital the next morning with the written request of the cardiologist, did the blood test, went to work, went back in the evening and picked up the results. Interesting. So you are saying you had an echocardiogram for 50 euros? I would love to hear the details of the examination, look at the images and review the report. Are you a Greek citizen or non Greek living in Greece?